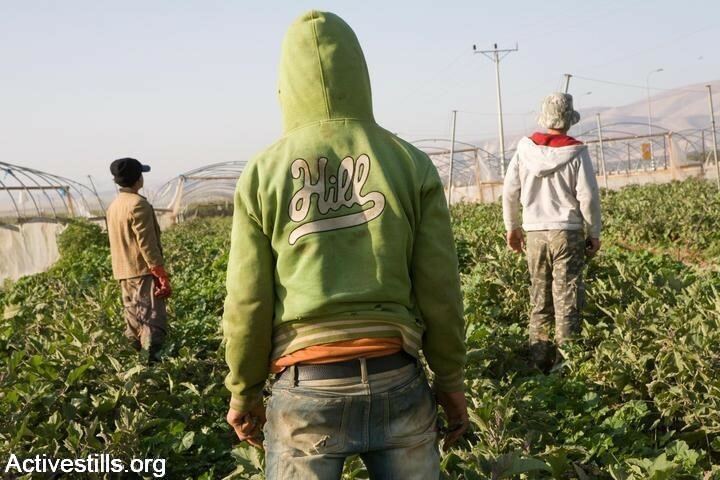 Thousands of Palestinian workers in desperate need of employment find themselves working under horrendous employment conditions on Jewish settlements in the Jordan Valley. They work for seven to eight hours daily for only around 65 NIS (18 dollars) per day, even though the minimum wage determined by law is 154 NIS per day. Moreover, they do not enjoy any of the other social benefits they are entitled to by law, such as a salary stub, vacation days, sick leave, holiday pay etc. Most of the workers are not aware of the dangers to which they are exposed to daily at work, and they are not supplied with proper clothing and accessories for protection from the toxic materials harming them. The workers regularly use pesticides and herbicides containing toxic substances such as chlorine, sold under commercial names such as the Taxopan. The pesticide used in potato crops enters the body through the respiratory system when it is sprayed. These substances create irritations and allergies in the nervous system, cause headaches and concentration problems. Among other substances, workers are exposed to phosphoric pesticides used to eliminate pests in hothouses, flower beds, fruits and vegetables. One of the substances, Parathion, enters the body through the skin, and causes muscle weakness and appetite loss. Among the pesticides used to eliminate weeds, RoundUp and Dachtalon cause swelling and damages the skin, eyes and digestive system. Workers who use pesticides do not feel their impact immediately, as with each use only a miniscule amount enters their body. That is exactly the situation for the workers from al-Auja village, located north of Jericho. These workers deal with pesticides daily and suffer from symptoms of light poisoning. They feel general weakness and some of them suffer from unnatural body swelling. Continuous poisoning poses the workers at risk. It is known that the accumulation of chemical pesticides in the body causes cancer. In Israel there are over 45 different kinds of pesticides used against insects, fungus and weed – 11 of which are outlawed in most other countries because they are known as carcinogenic. The chemical and physical qualities of these pesticides, especially when sprayed, makes it easy for them to enter the body through the respiratory system. This is especially true in the local warm climate. Therefore, the workers must demand protective masks, and refuse to spray pesticides when the climate is hot. When spraying in hothouses, employers must ensure the workers work in an adequately ventilated environment. Another risk is pesticides will enter the body through the skin. The Palestinian workers are currently not provided with the necessary gloves and protective wear to prevent such danger. Eating, drinking and smoking during the spraying increases the poisoning. The workers should avoid these practices and demand designated rest areas, which are removed from the fields. Anyone looking at the fields of the Jordan Valley can easily spot children, men and women who are directly or indirectly exposed to illnesses. One can see workers risking themselves by spraying the fields without taking any protective measures. In addition, one can see women and children, busily picking or cutting fruit contaminated by pesticides, work which exposes them to no less danger than if they were spraying the pesticides themselves. Children are particularly sensitive to these substances, and are in constant danger of damaging their fertility or developing cancer.